Diablo III came out yesterday (5/15/2012) and although it spent much time down because of the massive amount of traffic they were experiencing, I was able to spend a good couple of hours playing. I wasn't really sure what I wanted to play until a couple hours before doing so. 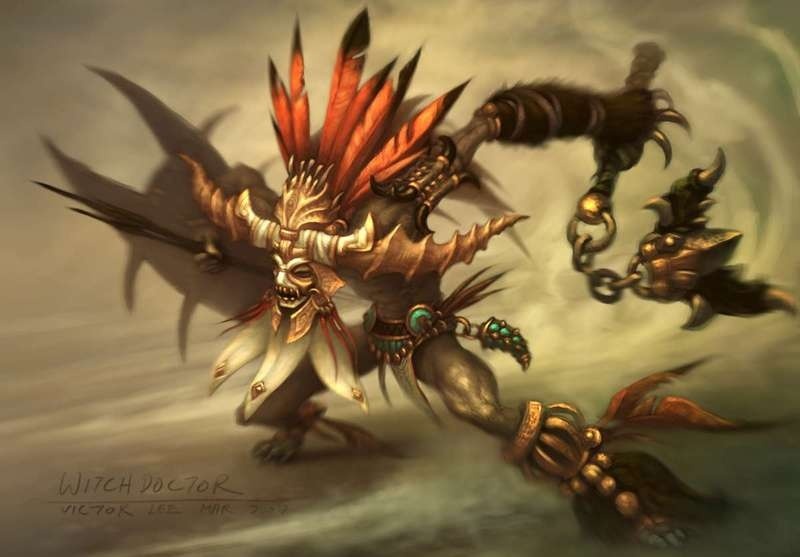 I originally settled on the wizard but when I got to the character creation screen I went for the witch doctor. I feel like whatever attracted me to play him is the same thing that made me want to play a warlock in WoW. I logged in and watched the great character intro scene. Once the game started I did the first thing necessary: turn down my graphics settings so it played at a decent framerate. I was a bit dismayed that my computer had as much trouble as it did, but it's from 2007 and its graphics card is from 2008 and well, what do you expect? The witch doctor started out okay. I had Shoot Poison Dart and Stab With Knife for my two actions. I didn't really enjoy that very much. But Shoot Poison Dart was quickly replaced by Throw Jar of Spiders and I really started to love the flavor of the class. In short order I also received Grabby Zombie Hands, Summon Zombie Dogs, and Shoot Flaming Bats and I was quite happy. The voice acting in the game is a wonderful addition. It allows you to take in the lore and story without slowing down and stopping, which is very important so that you can keep that Diablo pace without miss out on the story. I really enjoy the random spurts of lore you occasionally get from the "Lore" button that will occasionally appear in the bottom right of the screen. The more thorough questing system is a wonderful addition to the game. It still feels like Diablo (as opposed to WoW) but makes it much easier to keep track of what's going on. I also think that the skill system in Diablo III is great. For those who haven't played it you have skills bound to left mouse, right mouse, and 1-4. Each of those buttons has a particular set of skills that can be assigned to it, and there is no overlap in what skills can go in each position. Furthermore, skills have runes that are accessed as you level up which augment them. And skills cannot be switched out mid-combat. Having your skills locked to certain buttons gets me really excited. It's simultaneously simplifies the gameplay and challenges you. By not having access to all of your skills at a time you're forced to strategize outside and inside of battle. You have to figure out what skills go well together and execute them well. It allows for a great diversity of gameplay because switching out your skills and runes you can create a vastly different character. And yes, the game still feels like a Diablo game. With regards to the launch day issues: I don't feel contempt for Blizzard, because I do understand that there is a limited degree to which you can prepare for these things, but it is still their responsibility to prepare for it and I do hold them accountable. I understand all the reasons that they have for requiring the online connectivity and agree that it's the best choice, because it's not JUST a single-player game. There is an economy, of currencies both virtual and real, that is attached to this so that security is of paramount importance. Interestingly, I read an article a short while back about Zynga's server structure. They have their own servers that they use to host all of their games that they have custom built and everything, like anyone with a large number of servers should. However, they also utilize Amazon's cloud servers to deal with spikes in their server needs. This way they can quickly react to changing server loads without having the type of errors that Blizzard is having. Now, I don't work for Blizzard nor am I particularly versed in server things, so I don't know if there may be something that could keep them from doing such a thing, but it's definitely something that, if I were an executive and Blizzard and I had heard about, I would have the right people look into it.